Dave Sweet of the East Yellowstone Trout Unlimited chapter works to install a new rotating drum screen on an irrigation canal coming off of Trout Creek, a tributary to the North of the Shoshone River. The bypass tube back to creek can be seen on the left side of the canal near Sweet's foot. Thomas Reed photo. Trout Unlimited project managers wear many hats. From idea to implementation, we shepherd on-the-ground projects every step of the way and gather input from all the involved parties. These opinions (like nymphs in your fly box) can vary widely. Our job is to strike a balance that will benefit trout and satisfy the partners involved. When working on private land the most important partner is the landowner. If the project is a fish screen, for instance, the landowners are the people who will spend the most time interacting with the final product. Members of the East Yellowstone Trout Unlimited chapter work to install a new rotating drum fish screen on an irrigation canal coming off of Trout Creek. Thomas Reed photo. After reaching consensus on these issues and others, we can select the most appropriate screen type. On Trout Creek, near Cody, Wyoming, a self-propelled rotating drum screen was chosen because the site was protected due to its distance from the stream, the irrigation canal was small, and the site constraints were minimal (drum screens require more square footage than some other types of screens). 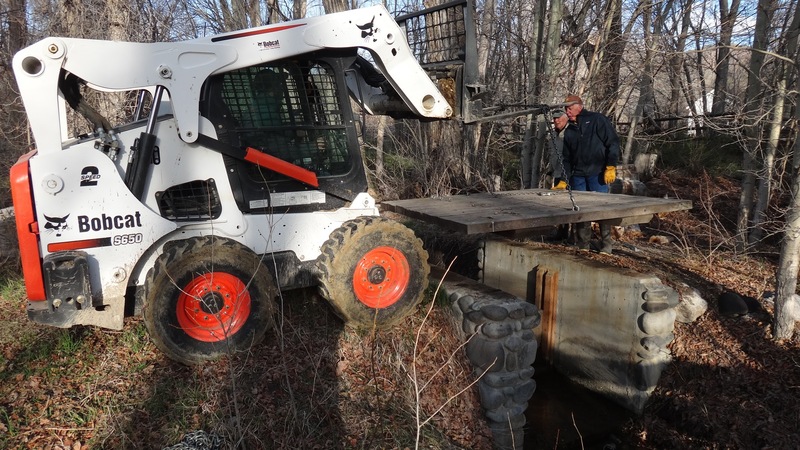 Members of the East Yellowstone Chapter of Trout Unlimited out of Cody, Wyoming, recently installed a self-cleaning rotating drum fish screen on Trout Creek, a tributary to the North Fork Shoshone River. The screen keeps fish from ending up in a field by diverting them from an irrigation canal back to the main creek. Chapter member Dave Sweet explains how it works. As the video shows, this was a great location for this type of fish screen. It delivers irrigation water and passes small debris downstream in the canal while re-directing fish back into the creek that is connected to public waters. The landowner is happy, the trout are saved, and anglers have more opportunity. The new rotating drum fish screen in place on an irrigation canal off of Trout Creek. Thomas Reed photo. The Trout Creek project is important because it protects trout (including some native Yellowstone cutthroat trout) that have left the North Fork of the Shoshone to spawn.The screen prevents those spawning cutthroat and their offspring from ending up in the middle of a field instead of back in the mainstem of the Shoshone. These fish then have access to hundreds of miles of public water.